Amid a rash of criticism over Burma’s candidate vetting procedures, one minority does not seem to be suffering any setbacks: the rich. RANGOON — Amid a rash of criticism over Burma’s candidate vetting procedures, one minority does not seem to be suffering any setbacks: the rich. A number of so-called “cronies” have cleared the interpersonal and administrative hurdles that left many prominent pro-democracy activists, followers of Islam and other non-mainstreamers behind. US-blacklisted Htay Myint and Khin Shwe, both of whom currently sit in Parliament, will seek re-election in the Nov. 8 poll, on which the hopes of a freer and more equitable Burma have been placed. Joining them on the campaign trail will be a number of other business moguls, in keeping with the status quo inherited from a 2010 election stacked with regime sympathizers. It’s unsurprising that the race of more than 6,000 candidates vying for 1,171 seats is packed with the well-to-do, particularly as many of them are incumbents, and several observers argue that it’s a good thing to have experienced businesspeople edging to rule Burma’s developing fiscal landscape. Others, however, said what matters is who they are and how they got there in the first place; many of the so-called “cronies” now competing to enter or stay in Parliament made their fortunes through connections to the former generals, and gained power in an election broadly viewed as fraudulent. A 2009 US diplomatic cable titled, BUSINESS CANDIDATES WILL RUN, LIKE IT OR NOT, published by WikiLeaks, demonstrated the United States’ concern over the vetting process during the last election, suggesting that businessmen were being exploited by the regime to fill its seats with loyalists who needed the military’s support to survive. Entering politics, the cable continued, likely countered the personal interests of Burma’s businesspeople, who would be forced to sacrifice time and publicly reveal their closeness with the regime. Six years later, that doesn’t seem quite as risky because of the easing of sanctions that followed a reforms rollout precipitated by that very election. But the context has arguably changed, so let’s take a look at the candidates. First up is Htay Myint, currently featured on the US Treasury’s list of Specially Designated Nationals (SDNs), who was identified by name in the abovementioned cable as a probable 2010 contender. He won that race, claiming a seat in Tenasserim Division’s Myeik Township, for which he seeks re-election. Htay Myint heads the Yuzana Company Ltd., a conglomerate dealing in construction, tourism, agriculture and manufacturing. He and recently delisted Win Aung were referenced in an earlier cable as the principal “cronies” chosen to facilitate aid in the aftermath of Cyclone Nargis, which—while allowing for much-needed humanitarian access—is widely believed to have resulted in land-grabs. Htay Myint has been implicated in numerous confiscation claims, including an enormous swath of farmland in Kachin State’s Hukawng Valley. Another blacklisted candidate is Khin Shwe, chairman of Zaykabar Construction Co., who currently sits in the Upper House representing Rangoon’s Kawhmu constituency. Opposition leader Aung San Suu Kyi will also be campaigning in Kawhmu, though the two will not be competing as they aspire to different chambers. Khin Shwe has also faced accusations of wrongful acquisition in Rangoon Division, taking to the Parliament floor in 2013 to threaten a lawsuit against the government if it did not defend him against the claims. At the time, the lawmaker did not deny that he had seized the land, arguing rather that the former military regime had allowed him to take it; hence he should not have to give it back. Both Htay Myint and Khin Shwe are, if it wasn’t already obvious, members of the ruling Union Solidarity and Development Party (USDP), which has kept many of its 2010 tycoons on board for the upcoming poll. Among them is current Minister of Commerce Win Myint, who is also the chairman of one of Burma’s largest import-export companies, Shwe Nagar Min. The minister seeks a seat representing the infamous Depayin Township for the Lower House. His deputy, Pwint San, will contest a seat beside him, as will the current Minister of Sports Tin Hsan, head of the ACE Group of Companies. Burma’s main opposition party, the National League for Democracy (NLD), has also brought in a few financial heavyweights. Both new to politics, the party has nominated Thet Thet Khine, the owner of Nandaw Gold and Jewelry as well as multiple residential developments, and Mi Kon Chan, a cosmetics importer belonging to perhaps Mon State’s wealthiest bloodline. The latter is related to Min Bayar San, the man behind the tourist-oriented restoration of the “Death Railway,” and will contest a seat in the Mon State parliament. Among the independents are Khin Hlaing, chairman of the manufacturing firm Zawtika, contesting in Rangoon’s Bahan Township, and Htay Aung of the Sakura Group, also seeking a seat in the former and commercial capital. Both of the men, who are among the city’s most affluent, were elected as central executives of the Yangon City Development Committee (YCDC) in an utterly underwhelming municipal poll held in December with a turnout of only about 2 percent of the city’s residents. Khin Hlaing is also known as an outspoken critic of five controversial developments near Rangoon’s Shwedagon Pagoda, which were thwarted by the government in early July following public outcry. 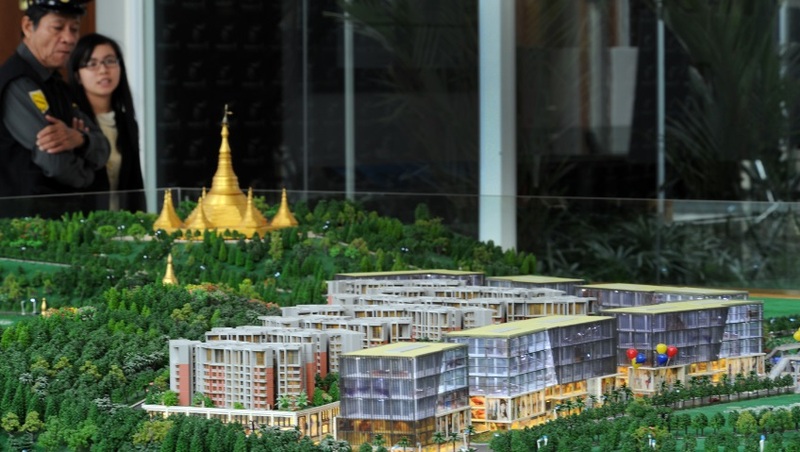 A model of the since-cancelled Dagon City development in downtown Rangoon. Response to the high-dollar delegates has been mixed among analysts, some of whom argued that the nomination of so many magnates reeked of Burma’s rich tradition of cronyism. Others took the position that the country needs savvy entrepreneurs to enact solid financial reforms and rejuvenate the economy, which stagnated under the military regime. Despite a sharp rise in foreign interest since the onset of reforms, many international firms still await further legal assurances before investing in the former pariah. To be fair, the economy has grown immensely; the country’s GDP has increased considerably since 2011 and is estimated to reach 8.5 percent growth by the end of the current fiscal year, according to the World Bank. Khin Hlaing, the independent runner from Rangoon, appealed to voters not to judge the man by his money. “What I’m asking is for people to just see what I’ve done—as a businessman, or a politician, or whatever—we have to do good things for the people,” he told The Irrawaddy. *Editor’s note, Monday Sept. 14: An earlier version of this article originally misidentified Khin Hlaing’s manufacturing firm as an oil and gas enterprise. Top Photo - (JPaing) Stacks of Burmese currency, called kyats.